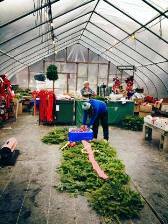 Christmas Trees, Wreaths, Centerpieces and More! Fresh cut Christmas trees are here! Check out our bountiful selection of lush, fresh-cut Christmas trees. We've got the best Christmas trees available to suit your needs in the Capital District, including Balsam Fir, Douglas Fir and Fraser Fir, in sizes ranging from 2' to 9'. So, whether you're looking for small Christmas trees, medium-sized Christmas trees, or large Christmas trees, your search is over! In addition to providing Christmas tree wrapping, for your convenience, we offer Christmas tree trunk drilling. Drilling a hole in the bottom assures that the tree stands straight, when placed in a special stand! 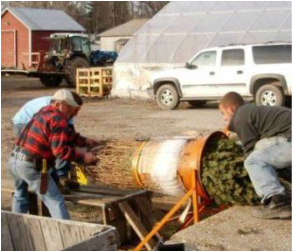 We are one of the few fresh-cut Christmas tree farms that can drill your tree trunk, and we sell the special stands here at the store. Share your Holiday Spirit with the world in a distinctive way with these Balsam Fir and Fraser Fir Christmas wreaths! Beautifully hand-crafted wreaths bring warmth to your home for family members and visitors, alike. Choose from 10 in. 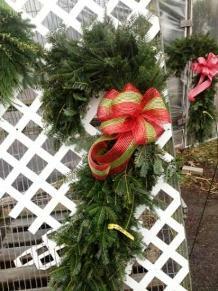 diameter wreaths, all the way up to 3 ft. - and even larger by custom order! 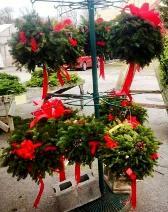 Available with or without decorations, these locally crafted, balsam and Fraser fir wreaths wreaths represent a lovely way to spruce up your Holiday decor! Hand-crafted and beautifully decorated, these clever trappings may be the perfect way to reverse a Polar Vortex! 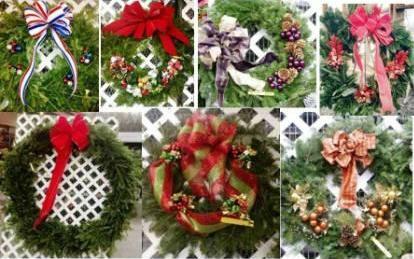 Wreaths, Locally Hand-crafted, Customization Available! The focus is on elegance and charm with these delightful Holiday table centerpieces! Choose from many balsam fir and Fraser fir sizes and styles, or have us create one just for you! 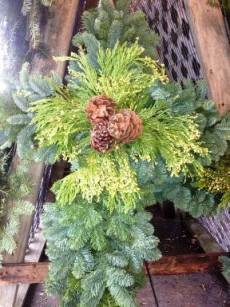 Let the Truth of Christmas ring from on high with these glorious balsam and Fraser fir crosses hand-crafted from boughs! Candy cane shaped fir boughs are sure to sweeten the Holiday fare, anywhere! Let your Christmas Spirit be your guide as you select from robust balsam fir and Fraser fir decorative pine boughs to complete your Christmas 2014 decorating ideas. In addition to balsam fir Christmas trees, Douglas fir Christmas trees, Fraser fir, fresh-cut Christmas trees; hand-crafted Christmas wreaths, kissing balls, centerpieces, crosses and candy canes, you'll find everything else you need for the perfect Christmas 2014 holiday look!